Our greenhouses are the heart of our business. 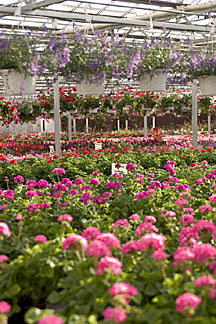 We proudly specialize in growing only the finest, florist-quality plants. More than 80% of our crops are grown right here in our greenhouses, assuring you the freshest and healthiest plants available. Lush green tropical plants are available in all sizes. They create a soothing and healthy environment. Bright flowering plants are always a cheery and welcomed gift. Stop in today to see what’s blooming!